The International Criminal Court said it had jurisdiction to investigate Myanmar officials over violence against the country’s Muslim Rohingya minority, with potential crimes-against-humanity charges.… that led to 700,000 Rohingya fleeing across the border to seek refuge in Bangladesh.… The three-member fact-finding mission estimated that 10,000 people were killed, a figure they labeled as conservative. Is a religious person acting in an illegal manner if he violates the laws of the land when practicing his religion? And how does this even happen? What law is so vital to the general welfare of The People that would be threatened by someone practicing their religion? Should a political entity or party or country have the power to enforce laws that force “their” people to change their religious beliefs? To me, this depends on how you have formed your government and on what basis. In the U.S. it is “We The People,” and our Constitution is there to limit the government from encroaching on our rights, but that isn’t true in all countries on this earth. In some countries, government is the “Place of Power” and all rights emanate from—or are granted by—the government. 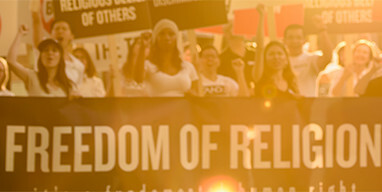 Should a religion ever have a practice that violates the laws of its country? This is not so easy. It is not for you or me to tell another what his religion is. Overreaching laws can make almost anything illegal. In the world today, this is much muddied up. Should a country be able to force a religious practice upon its citizens? Or deny them a practice of their own? Again this is a question of the purpose of government. A lot more could and should be said and debated about these questions, but, ultimately, they will have to be answered—and answered well—for religious freedom to exist on Earth. And somehow religion and government, these two important arenas of human interaction, must come to terms with one another and acknowledge the potential goodness and intent in both. No matter the final actions a government takes, the original intent people had for forming governments in the first place was to better their lives, and the same is true with religion. Religion exists and is embraced by people to better their lives. The first step to a resolution is an acceptance of the fact that neither religion nor government can supply all of the things necessary for people to live together. To me, the answers to these questions comes down to purpose. Is the government following through on its purpose to better the lives of its people? Not to hold power or perpetuate itself, but to better the people? Then inhibiting religion would be counterproductive. The same would go for religious practice. Religion needs to recognize the value to its faithful of having a stable government, and see how having a stable government gives it more religious freedom and more religious practice. Next would be to recognize what is and isn’t your job. Too often—and certainly over the last 50 to 100 years—government has encroached heavily on what has traditionally been the field of religion. Education, mental health, social security, all have traditionally been the province of religion and have deteriorated markedly since government took them over. Governments are better than religions at raising money (taxes) by far, but religion is better at doing humanitarian jobs. The same holds true with certain public matters—roads, courts, and the rules that bind a diverse people together are better handled by government than religion. But religious freedom will only exist where there is a balance between these two vital social structures. And the first step to a resolution is an acceptance of the fact that neither religion nor government can supply all of the things necessary for people to live together. And then a recognition that both groups have similarly constructive goals. Certainly not the same, but similar goals—similar enough that they are not in “natural conflict” as many have suggested. From there, a true resolution to these questions can appear. And then, perhaps, religious freedom. Entrepenur, Dad, Scientologist, occasional basketball coach, researcher and a huge Far Side fan.